We have had so much fun with this activity that we do it at least once a week. The kids know the drill even down to the clean up (see below). When you can’t decide whether to play with Legos or to paint…. Do both! If you are looking for other fun things to paint with, visit my blog post about Unique Painting Tools. Set Up: Pick out your paint colors and your legos. Place some paint into each bowl and place the corresponding lego with it. Have your paper close to the bowls to avoid too much mess. Step 1: Using your paint brush, paint the small circles on the top of your lego and then stamp it onto your page. Reapply the paint after each stamp. Step 2: Place the bottom of your lego directly into your bowl of paint. Make sure all 4 sides get paint on it. Try to align your lego over your first stamp. It doesn’t have to be perfectly centered. Step 3: Repeat using all of the colors until you have your masterpiece! 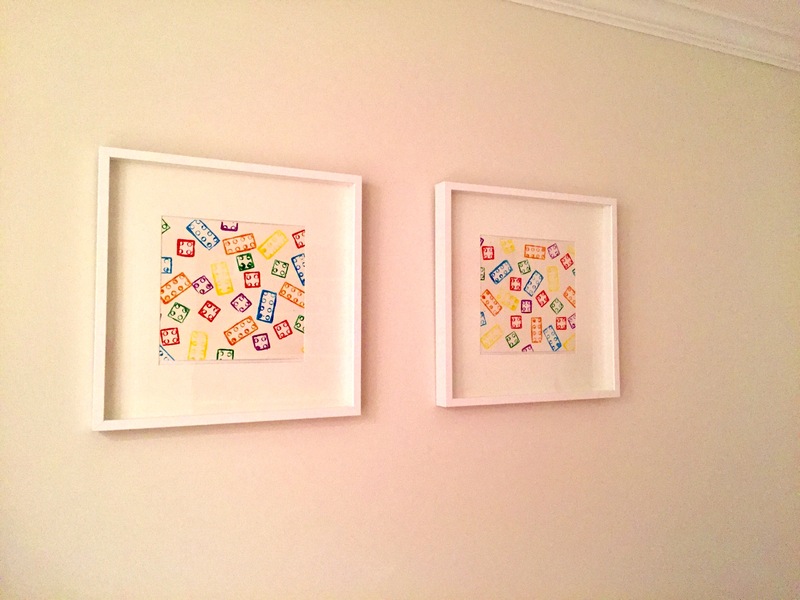 We loved the outcome so much that we framed them for our playroom/arts and crafts room. The kids are so proud to have their artwork framed so professionally. Toddlers: While the above pictures were created by my 6 year old, my 3 year old still enjoys this activity as much, if not more, than her older sister. The excitement that comes from being allowed to dip your toys in paint and paint them with a paint brush never seems to get old for her! Just don’t expect perfection at all!! For the toddlers its much more about the process than the finished product. Get Creative: Here is a cute design that we made using the bottom of the Legos. Play around with them, we would love to see what you come up with! Clean Up: If your little one is anything like mine, then he/she loves playing with water. I take the bowls and legos, drop them in her bathroom sink and she cleans them herself. Since we only use these bowls for art and crafts it doesn’t matter if there ends up being a bit of paint left on them. We hope you have us much fun as we do with this activity! I bet even older kids would enjoy Lego painting. Fun!